Tender Calamari and warm root vegetable soup. This past President’s Day weekend we took advantage of some frequent flyer miles to visit with a few friends living up north in Seattle. It had been years, over 15, since our last trip to the rainy caffeinated gem of the Northwest, as one of our friends described it, people don’t walk upright in Seattle, they walk horizontally – how much more laid back can a city get? Seattle has so many spots serving terrific local food, narrowing to just a few was tough. Thanks to friends’ suggestions, we enjoyed delicious meals all weekend. Tuna Salade Nicoise and goat cheese tartine. Shortly after landing, we were seated at Café Campagne, a charming spot near Pike Place Market. It is a welcoming place with tasty food and a comfortable dining room away from the rain and wind. Warm bowls of root vegetable soup took the chill off the morning. While we both enjoyed the St. Jude’s Tuna Salade Niçoise and the goat cheese tartine, the standout of the meal was the calamari. A calamari dish distinguishes a kitchen. Well-executed calamari, however prepared, signifies competence and care. The small, warm rings that came to the table were lusciously dressed with olive oil, butter, garlic, capers, parsley and lemon. They were fresh and nicely seasoned – and they were tender! Not a single rubber band on the plate. We were impressed. 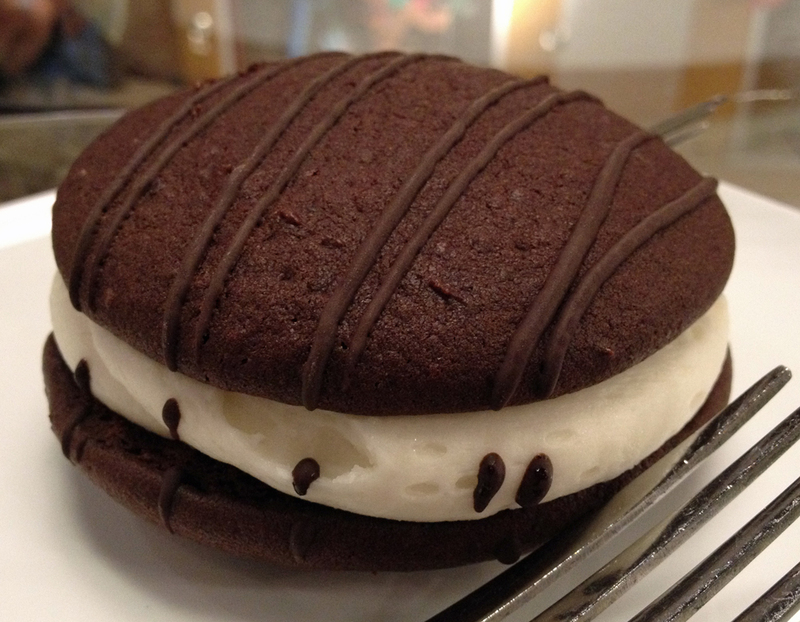 Whoopie Pie didn't make us scream "Whoopie!" more like "meh." We skipped dessert at the restaurant and headed over to The Chocolate Box to satisfy our sweet tooth. Walking through the doors into the shop away from the cold rainy weather, we were nearly knocked over by the strong aroma of chocolate. The display of delicious looking treats presented an intimidating array of options, but we ended up settling on a Whoopie Pie that Steve had his eye on. Sadly, it was much drier and not as fresh tasting as we had expected. We still finished it all and washed it down off with a warm Chai Latte. After drinking several cups of coffee that morning and walking past all the coffee shops in the city, we’d had enough. The tea was a welcomed treat. For dinner we dined at Tom Douglas’ Cuoco. We both went vegetarian on our entrees, but when the restaurant treats the table to a plate of prosciutto, it’s just rude to say ‘no’. Fresh buffalo mozzarella, pomegranate seeds, garlic, grilled bread; roasted cauliflower; roasted Brussels sprouts with huge (overwhelming) chunks of Sardinian cheese; Tagliatelle pasta with gorganzola cheese; these were just a few of the delicious items we ate there. 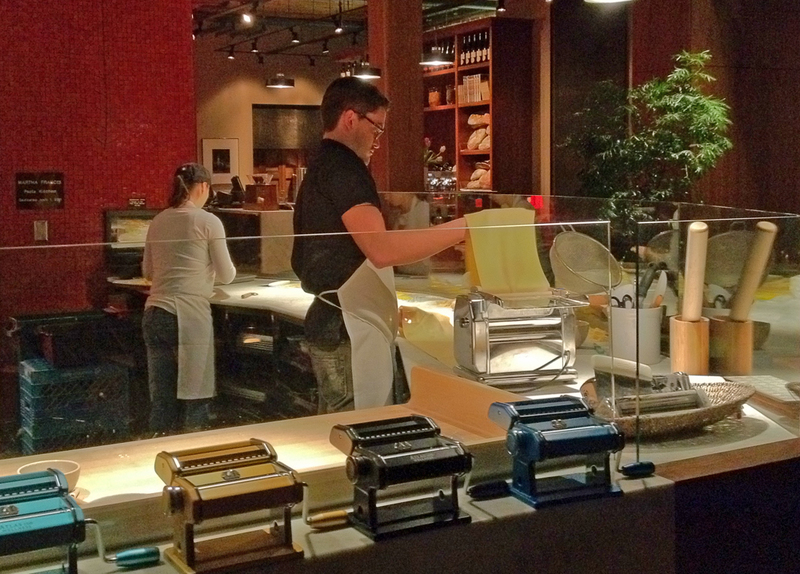 Fresh pasta being made at Tom Douglas' Cuoco. We enjoyed Saturday brunch at Skillet Diner where we gorged ourselves on their huge-assed cinnamon roll. Regrettably, we forgot to take pictures. The friend who introduced us to the placed dove into a hamburger and plate of poutine. We decided to go with a couple salads, and share the scramble special (yawn). We did get a taste of the poutine and the burger, which was all we needed—seriously! The place is a neighborhood gem that draws a big weekend crowd. If you go, be prepared to wait for a table. No reservations. On Saturday night, dear friends introduced us to Lark, a Capitol Hill restaurant run by Johnathan Sundstrom, a James Beard Award-winning Chef. The owners have taken a decidedly local approach to sourcing the foods that end up on a constantly changing menu of well-executed small plates. The menu invites experimentation and we dove in with gusto, feasting on; apple, beat and Treviso salad, sautéed wild mushrooms, roasted sunchokes, creamy farro, carpaccio of Yellowtail tuna, octopus with Chistorra chorizo, crispy Liberty Farm duck legs, pork belly (two ways), and Oregon Fallow venison (the table’s least-favorite dish). Our party’s wine expert ordered a bottle of the lovely Owen Roe Ex Umbris Syrah (Columbia Valley ’09). It was a nice companion to the evening’s many dishes. We finished with a delicious pineapple tarte tatin, and date, hazelnut brown butter cake – both tasty, but we liked the pineapple tarte best. Lauren, we loved the food in Seattle!